To submit a protein sequence for prediction, following steps have to be followed. The numebr in parenthesis indicates the corrosponding input box of submission form (displayed in Figure 1). Paste/upload FASTA format protein sequence. The probability of correct prediction directly depends on the threshold. For prediction with high confidence (less probability of false positive prediction) high threshold should be choosen. At low threshold, the probability of false negative prediction is very low. On default theshold (-0.2) the rate of false negative and false positive prediction was nearly equal during training of SVM model. Click 'Run Prediction' to submit protein for prediction. Figure 1: PredHSP submission page showing how to insert input sequences. PredHSP process only protein sequence file in fasta format. User have option to cut and paste in the text box or directly upload the sequence file. The limits of PredHSP is upto 25 sequences at a time. If user submit more than 25 sequences, PredHSP predict only first 25 sequences. Following figure 1 is an example showing how to submit a query in PredHSP. 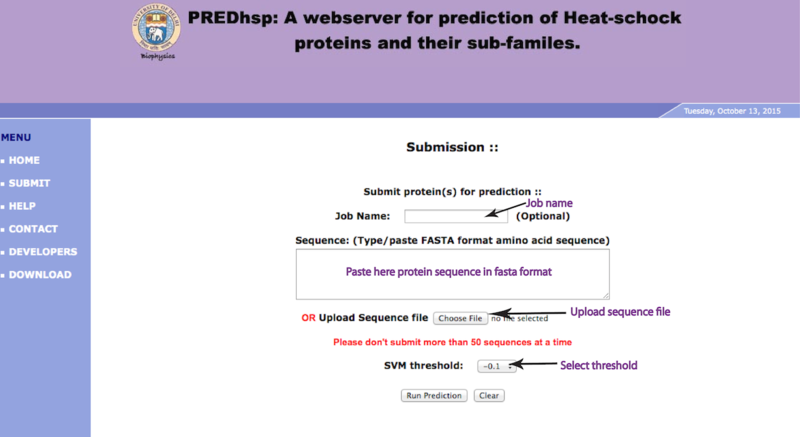 In response to the submitted protein sequence(s), PredHSP generates the prediction result in tabular form. We also provide a job number, if user have any query regarding their result, he/she can contact us. Here is a sample of prediction done in response to query sequences (Figure 2). Figure 2: Screenshot of PredHSP prediction result.